When Dodge revealed the Challenger SRT Demon we were intrigued with how it could lift its front wheels off the ground in a drag race launch but that was a purpose built drag racing car. The Lamborghini Aventador SVJ is an all-round exotic built for performance and presence and that performance seems to be rather impressive, at least in Thrust Mode (launch control). It managed to set quarter mile times in the mid-10 second range which puts it within a second or so of the Demon. 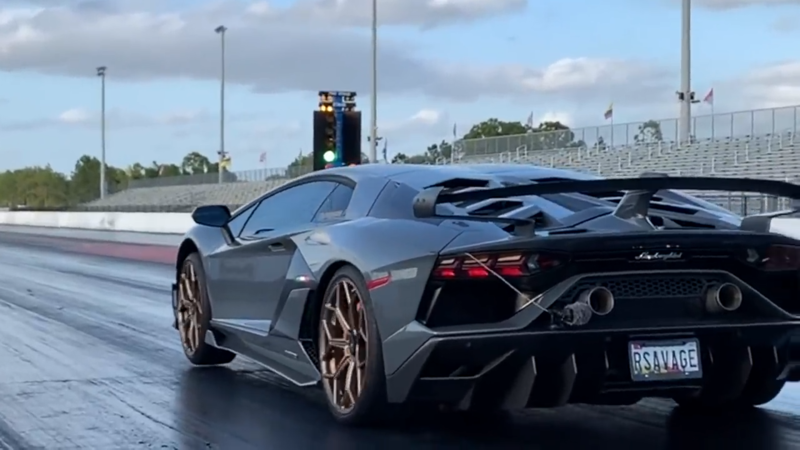 In this video from DragTimes, we get to witness the Lamborghini Aventador SVJ not only break the record for the fastest Lamborghini in the quarter mile but ever-so-slightly lift its front wheels off the ground to execute a “wheelie”. While there’s barely enough space between the tire and the pavement to shove a deck of playing cards, we’re still amazed that it happened in the first place. It’s a testament to the utter savagery of Lamborghini’s Thrust Mode. As a fitting end to their big day, the DragTimes crew celebrates with donuts of the tyre-shredding variety.